“Lifecycle cost vs. Upfront cost” – it is a constant process for us to explain the cost-savings of Redco™ FRP products when seen over time. Traditional materials are often cheaper; however, after maintenance and replacement costs are factored in FRP comes out as the more cost-effective material over time. While we can explain the reasons FRP has a lower lifecycle cost, including that it is virtually no maintenance and will not rot or rust, one notable case study can illustrate Redco™ FRP’s potential. 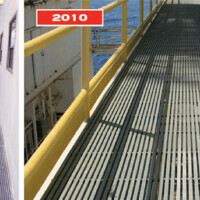 In 1979 DURADEK® grating was installed on Shell’s offshore Ellen platform in Southern California. 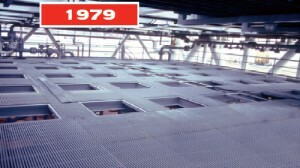 After 34 years of continual exposure to the elements including sunlight, salt, rain, abuse from surface safety valves and even accidental sandblasting – not to mention 34 years of regular work – the grating is still in excellent shape. It has not needed any significant maintenance, repainting or replacement despite the harsh, corrosive environment it is subjected to.